Our modern-day schedules are jam-packed from the moment we wake up in the morning until we make it back to bed at night. Between family obligations, school runs, traffic, grocery shopping, meetings, meal prep and trying to squeeze in a few minutes of conversation with your nearest and dearest, our lives are pretty much go-go-GO the whole time. This explains why many people have trouble winding down at night, which leads to much frustration when we can’t fall asleep. Fortunately, there is a very simple way to wind down before you go to bed, which also happens to be wonderful for your mind and body. Yoga! 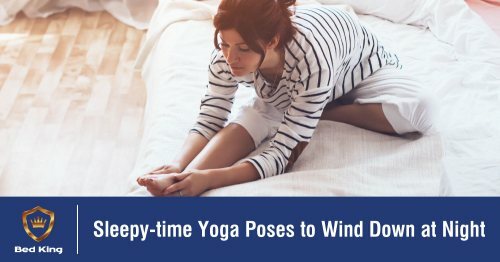 While certain yoga practices are tailored to get your heart rate up and give your body a get-up-and-go workout, there are certain poses that do just the opposite - gentle stretches that allow your body to relax and ready itself for slumber. Also called 'balasana', child's pose stretches the hips, thighs and ankles by gently relaxing the muscles along the front of the body. Stand on your hands and knees, with your hands at shoulder width and your knees at hip width. Turn your big toes inward to face one another, spreading your knees as far apart as is comfortable, sink your hips back to your heels and settle your chest between your thighs with your arms extended to the front and your forehead resting on the ground. You can also roll your head from one side to the other to give your face a gentle massage. Also called 'ananda balasana', the Happy Baby pose stretches the hamstrings, calms the mind and soothes the spine to relieve lower back pain. Lie on your back, bring both knees back to your chest, grab your two big toes with your middle- and index fingers and then pull your heels up to the ceiling while keeping your tailbone on the ground. Also called 'marjaryasana and bitilasana', the Cat and Cow poses increase flexibility of the neck, shoulders and spine and simultaneously stretches the muscles of the hips, back and abdomen. Stand on your hands and knees with your back in a neutral position. Go into Cat pose by exhaling and tilting the crown of your head and your tailbone to the ground, which will arch your spine into a C-curve and bring your shoulder blades apart. Next, inhale and bring your crown and tailbone upward to hollow out the lower back. Flow in and out of these poses until you feel your spine is nice and relaxed. These are a few of the yoga poses you can try before bedtime to relax and unwind your body in preparation for sleep. Keep an eye on the blog in coming weeks and months as we share more expert advice on this subject. In the meantime, we would like to invite you to take part in our #SleepRevolution. Sign up for the Bed King Sleep Challenge to stand a chance to WIN up to R20 000 in prizes. Competition valid until 16 February 2019. Ts & Cs apply!